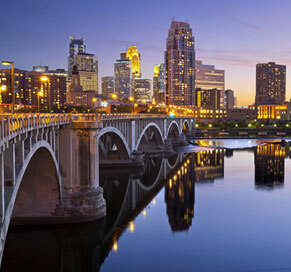 SiebenCarey has three personal injury law offices to serve you located throughout Minnesota. Our main office is located in the AT&T Tower in downtown Minneapolis. Prior to moving to this location in 2012, our office was located just down the street in the Midwest Plaza Building for more than 30 years. No need to worry about parking as there is a ramp next to our Minneapolis law office (see directions below). We will also validate your parking ticket, so bring it with you when you come to our office. The Minneapolis office of SiebenCarey is headquarters to 16 of our lawyers as well as our extensive support staff, including paralegals, investigators, technology specialists and legal assistants. Our attorneys represent people injured in the seven-county Minneapolis-St. Paul metropolitan area and throughout the states of Minnesota and Wisconsin. In many cases, our lawyers or investigators will travel and meet where it is most convenient for you. Our other personal injury law offices are located in Lakeville and Duluth. The SiebenCarey Minneapolis office is located on the 5th floor of the AT&T Tower at 901 Marquette Avenue. Exit on Washington Avenue and turn right on Washington Avenue to 2nd Avenue. Turn left on 2nd Avenue and follow to 9th Street. The entrance to the Oracle Centre Parking Garage is on your right just after crossing 9th Street. Take 35W going north to 5th Street exit. Take 5th Street to 9th Street and turn left on 9th Street. The entrance to the Oracle Parking Ramp is on your left on 2nd Avenue South. I-94 to the 4th and 7th Street exit; follow North 7th Street into downtown. Turn slight right on North 10th Street. Turn left to Marquette Avenue. The entrance to the Mar-Ten Parking Ramp is on your right. I-94 to the 11th Street exit, follow 11th Street to Marquette Avenue. Turn right on Marquette Avenue. The entrance to the Mar-Ten Parking Ramp is on your right after crossing 10th Street. I-394 east to Minneapolis. Take the 12th Street exit. Go right on 10th Street. Turn left on Marquette Avenue. The entrance to the parking ramp is on your right after crossing 10th Street. Take Hwy 55 east to North 7th Street. Turn right on North 7th Street. Turn slight right to North 10th Street. Turn left on Marquette Avenue. The entrance to the Mar-Ten Parking Ramp is on your right. If you are the victim of a car accident, motorcycle accident or truck accident, whether as a driver, passenger, bicyclist or pedestrian, you can receive compensation for medical bills, lost wages and other expenses related to your injuries. We will also insure that you are treated fairly by your insurance company and their lawyers. Our personal injury lawyers handle many types of injury cases, from premises liability (home accidents), defective product cases and slip-and-fall accidents, to boating, snowmobile, construction and other accidents. If you’ve been injured by the negligence of another person or organization, we can help you take control of your situation and get compensation for your injuries. Minnesota workers’ compensation laws cover people injured on the job in Minnesota. Our workers’ compensation attorneys will work exclusively with you to obtain compensation for medical expenses, wage loss, permanent disability and job re-training. Very few personal injury law firms in Minnesota also provide representation in workers’ compensation cases. If you or someone you love is injured or dies as a result of medical malpractice, meaning improper or negligent health care treatment, our Minneapolis medical malpractice attorneys can help. We handle all types of cases involving medical negligence, from birth injury to wrongful death lawsuits.